I call this Lucy's Salad, because the recipe was given to me by a lady named Lucy, who was on the Junior League Marketing Committee with me before I became a Junior League drop out. Fresh romaine is gorgeous, isn't it? 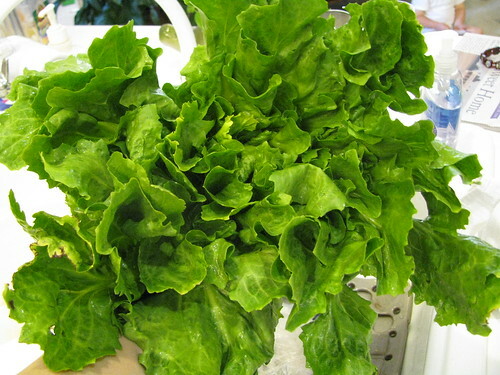 The only lettuce prettier is Bibb. 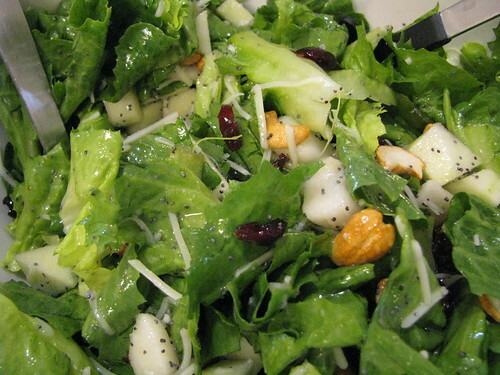 This salad tastes sweet, with a bit of tart from the apples and craisins. Perfection! *I buy any type of pear that I can find that is soft and ripe. Usually Anjou pears, but I'll take a Bartlett if they are softer. Visit Rachel for more amazing recipe links. Remember - comment by midnight on Monday - Labor Day - to win 4 tickets and 4 ride wrist bands for the Tennessee State Fair. Oh mah goodness! That looks heavenly. I made a great salad this weekend too. Might have to post the recipe! That is right up my alley! Have you tried Sunset Grill's Sonoma Salad? KIND of similar. YUM! Jill - You should! It's nice to find salad recipes that people have tried and you know will be great. mudmama - My favorite salad in Nashville is Green Hills Grille's signature salad - baby bibb lettuce, slivered almonds, shredded swiss, and homemade honey mustard dressing. So simple and perfect! I need to replicate it home actually. OH! I may be running to the grocery again for the third time this weekend. That looks delicious! 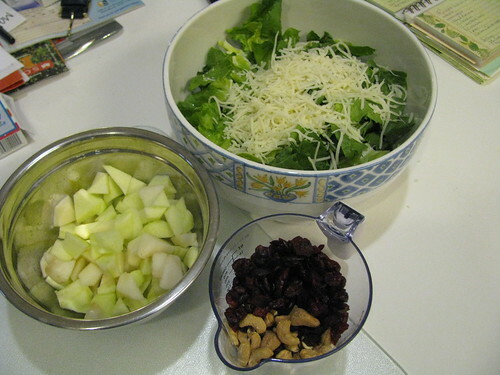 I love pears, walnuts, cranberries and apples in salads. This is SO getting bookmarked! That dressing sounds nommy. That looks fab and I do need to step away from the predictable salad routine. Thanks! YUM! I do one that is similar and it's a staple at our house! There isn't much that beats a homemade salad dressing. p.s. one of my favorite blogs I first discovered was Jr. League Dropout...she's since moved on to another blog but I loved that name! My mouth literally was watering by the time I reached the last photo. Fruit in salads -- yes. I'll be making this SOON. Thanks! Faith and family, recipes and occasional bursts of de-cluttering, and some attempted photography. This is a blog of favorite things, and two of my favorite things are baby milk breath and margaritas. Welcome!